Nina Treadwell's research and publications focus on the experiential dimensions of performance and improvisation, with a particular emphasis on multi-media works. Her monograph Music and Wonder at the Medici Court: The 1589 Interludes for “La pellegrina” appeared under the imprint of Indiana University Press in 2008. The book is informed by her experience as a performer (on plucked-string instruments of the Renaissance and Baroque periods) and explores the visceral responses of audience members with regard to the confluence of aural and visual media in Florentine spectacle. Professor Treadwell's publications on Italian music of the sixteenth- and seventeenth-centuries have appeared in journals such as Cambridge Opera Journal, Women and Music, Lute Society Journal, Musicology Australia, and Ars Aeterna, and the edited collection Gender, Sexuality, and Early Music. Professor Treadwell is currently working on two new monographs. The first is entitled: Queer Musicking: Performing Culture in Sixteenth-Century Italy. The book is a series of case studies using intersectional analyses grounded in queer theory, and draws on the experiential dimension of Treadwell's work as a performer of 16th-century Italian music. The second monograph builds on her work on race in the context of the Portuguese and Italian slave trade, with the working title: Music in Motion: Iberian and Black African Influence in Italy, 1490-1630. Professor Treadwell is the recipient of numerous awards including grants from the Australian Federation of University Women, the Andrew W. Mellon Foundation, the Newberry Library, and the American Musicological Society. During Winter 2010 she was Visiting Associate Professor of Musicology at the University of California, Los Angeles. Professor Treadwell is a specialist in early plucked-string instruments, and performs both in the US and abroad as a soloist and continuo player. She has a broad range of performance experience especially in early baroque music, including performances in Dublin as principal theorbist for Monteverdi’s Orfeo and more recently in festivals with baroque violinist Marja Gaynor. Her debut performance with Ms. Gaynor in 2013 received a 5-star review in the Irish Examiner. Echoes. Voxfire, with Nina Treadwell (theorbo & baroque guitar) and various artists. Voxfire, 2006. The Pellegrina Project. 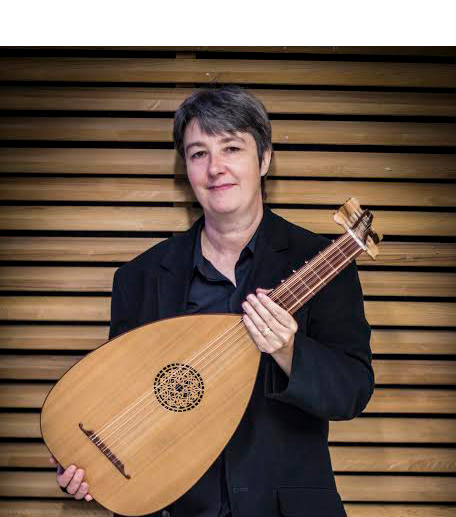 Nina Treadwell, director, chitarrone, baroque guitar. Compact disc recording that accompanies my book Music, Wonder, at the ‘Medici Court. Squires Music Productions, 2005. Our Bite is Better Than Our Bark [Rubedo Canis Musica Promotional Sampler, 1999], track 3: “The Leaves Be Green,” Nina Treadwell & James Tyler, lutes. "The Leaves Be Green": Elizabethan Music for Lutes & Mixed Consorts. Musica Viva, dir. James Tyler. Rubedo Canis Musica 19604, 1998. Roland de Lassus. La Cortesia. Ensemble de' Medici. Rubedo Canis Musica 19502, 1995. Heinrich Isaac. Natalis Domini. Ensemble de' Medici. Rubedo Canis Musica 19501, 1995. Girolamo Frescobaldi. Begli occhi io non provo. Ensemble de' Medici. Rubedo Canis Musica 94001-2, 1994. Treadwell, Nina. “Queer Audiovisual Creativity: Fan-Created Music Videos from Star Trek to Bad Girls.” In The Oxford Handbook of Music and Queerness, ed. Fred Maus and Sheila Whiteley. Oxford and New York: Oxford University Press, 2018. Treadwell, Nina. “‘Now I come to you, ladies, after so much time’: Cleopatra, Maria d’Aragona, and an intermedio for the Duchess of Alba.” Cambridge Opera Journal 22/1 (2011): 33-63. Treadwell, Nina. “Female Operatic Cross-Dressing: Bernardo Saddumene's Libretto for Leonardo Vinci’s Li zite ’n galera (1722).” In Opera Re-Made, 1700-1750, ed. Charles Dill. Aldershot: Ashgate, 2010, 139-164, in The Ashgate Library of Essays in Opera Studies [Re-issue of article originally published in Cambridge Opera Journal10/2 (1998)]. Treadwell, Nina. "Bastarda Musicians and the Practice of Musical Anamorphosis." Ars Aeterna 2/1 (2010): 28-39. Treadwell, Nina. Music and Wonder at the Medici Court: The 1589 Interludes for "La pellegrina" (Bloomington and Indianapolis: Indiana University Press, 2008). CD included. Treadwell, Nina. "Music of the Gods: Solo Song and effetti meravigliosi in the Interludes for La pellegrina." Current Musicology 83 (Spring 2007): 33-84. “She descended on a cloud ‘from the highest spheres’: Florentine monody ‘alla Romanina.’” Cambridge Opera Journal 16/1 (2004): 1-22. “‘Simil combattimento fatto da Dame’: The musico-theatrical entertainments of Margherita Gonzaga’s balletto delle donne and the female warrior in Ferrarese cultural history.” In Gender, Sexuality and Early Music, ed. Todd M. Borgerding. New York and London: Routledge, 2002, 27-40. "Female Operatic Cross-Dressing: Bernardo Saddumene's Libretto for Leonardo Vinci's Li zite 'n galera (1722)." Cambridge Opera Journal 10/2 (1998): 131-156. "The Performance of Gender in Cavalieri/Guidiccioni's Ballo 'O che nuovo miracolo' (1589)." Women and Music: A Journal of Gender and Culture 1 (1997): 55-70. "Guitar Alfabeto in Italian Monody: The Publications of Alessandro Vincenti." Journal of the Lute Society 33 (1993): 12-22. "The Guitar Passacalles of Santiago de Murcia (ca. 1685-1740): An Alternative Stringing." Musicology Australia 15 (1992): 67-76. "On the Use of Fingernails when Playing the Baroque Guitar." Context: A Journal of Melbourne Music Postgraduates 2 (Summer, 1991): 16-19. "Santiago de Murcia: Prelude and Allegro in D minor." Australian Music Teacher 1/4 (1991): 236-242. Organ Studio, Schoenberg Music Building, UCLA. “Musica dolce e stravaganza.” Marja Gaynor; baroque violin, Nina Treadwell, theorbo & baroque guitar, with Christen Herman, mezzo soprano & Elizabeth LeGuin, baroque cello. Strozzi, Trabaci, Lambardi, Uccellini, Matteis, Pandolfi, Vivaldi. February 12, 2015. East Cork Early Music Festival. Cork Baroque Orchestra, with guest director Elizabeth Wallfisch, baroque violin. Nina Treadwell, theorbo and baroque guitar continuo. Vivaldi, Telemann, Schmelzer. Curtis Auditorium, CIT Cork School of Music, Ireland. October 10, 2014. Sligo Festival of Baroque Music. “Musica dolce e stravaganza.” Marja Gaynor; baroque violin and Nina Treadwell, theorbo, lute, baroque guitar. Spinacino, Uccellini, Matteis, Leonarda, Pandolfi. September 28, 2014. Liss Ard Estate, County Cork, Skibbereen. Culture Night, Ireland. Nina Treadwell, 19th-century guitar, baroque guitar, and theorbo, with Aoife O’Donovan, flute and baroque flute. Visée, Locatelli, J. J. Quantz, and Cerruti. September 19, 2014. Gala Concert: East Cork Early Music Festival. Curtis Auditorium, CIT Cork School of Music, Ireland. With Kim Sheeham, soprano, Marja Gaynor, baroque violin, Malcolm Proud, organ, and Nina Treadwell, theorbo. Handel, Purcell, and Pachelbel. September 4, 2014. Grove House, Schull, County Cork, Ireland. With Marja Gaynor, baroque violin, Nina Treadwell, lute, theorbo, baroque guitar, and Camilla Griehsel, soprano. Monteverdi, Stefani, Visée, Purcell. August 24, 2014. Mission Music for Pentecost. Performance of full Mass. Archlute continuo for Misa en sol by Juan Bautista Sancho, works from Santa Clara Ms. 4, and Corelli church sonatas for processional and recessional. Directed by Susan Feldman, baroque violin. Serra Chapel, San Juan Capistrano Mission, California, USA. June 8, 2014. MIC Chapel, University of Limerick, Ireland. “Musica dolce e stravaganza” with Marja Gaynor, baroque violin and Nina Treadwell, theorbo and baroque guitar. Strozzi, Castello, Uccellini, Matteis, Purcell, Baltzar, and Vivaldi. March 26, 2014. Pasadena Schubertiade: A Voxfire Valentine. 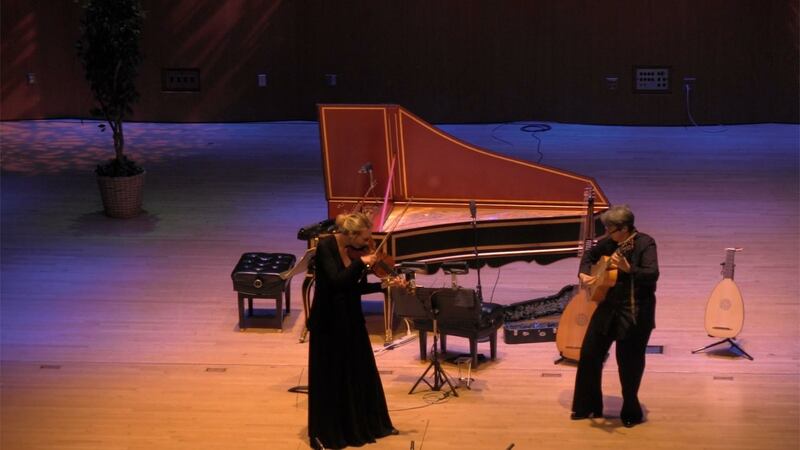 Voxfire with William Skeen, bass viol, and Nina Treadwell, theorbo, baroque guitar. Including works by Purcell, W. Lawes, Laniere, Blow, Monteverdi, Luzzaschi, Strozzi, G. Caccini, Frescobaldi, Lambardi, and Trabaci. Neighborhood U.U. Church, Pasadena, California, USA. February 14, 2014. Cork Orchestral Society Season Opening Concert with Kaleidoscope Camino. Performed opening set playing Renaissance lute solos. Compositions by Da Milano, Dowland, and Kapsberger. Aula Maxima, University College Cork, Ireland. October 17, 2013. East Cork Early Music Festival. Cork Chamber Choir and the Dublin Viols with Nina Treadwell, Renaissance lute & Renaissance guitar. Including works by Dowland, Morley, Gibbons, and Byrd. Midleton, Co. Cork, Ireland. Oct. 12, 2013. East Cork Early Music Fringe Festival. Festival Flashmob. Heinrich Biber’s Battaglia à 10 (1673). Continuo coach and section leader for performances in Midleton, Co. Cork and Cork City, Ireland. October 5, 2013. Kinsale Arts Festival. Marja Gaynor, baroque violin, and Nina Treadwell, theorbo & baroque guitar. Trabaci, Lambardi, Castello, Leonarda, Uccellini, Matteis, Dowland, Baltzar, and Vivaldi. Kinsale, Ireland. July 12, 2013. •Five-star review in Irish Examiner, 59/407 (July 17, 2013). “Baroque ‘n’ Roll: A Concert of 17th and 18th Century Chamber Music” with Marja Gaynor baroque violin and others. Theorbo & baroque guitar continuo. Castello, Merulo, Uccellini, and J.S. Bach. Stack Theatre, CIT Cork School of Music. Mar. 13, 2013. “Sagittarius: Schütz: The Mature Voice” with Resurgum, Camerata Kilkenny, and Quintessential. Theorbo continuo. City Hall, Dublin. Feb. 23, 2013. Part of a three-concert mini series by Resurgam, one of Ireland’s foremost choral ensembles, directed by Mark Duley. “Sagittarius: Schütz in Italy II” with Resurgum and Camerata Kilkenny. Theorbo continuo. City Hall, Dublin. Feb. 16, 2013. “Sagittarius: Schütz in Italy I” with Resurgum and Camerata Kilkenny. Including solos for lute by G. Kapsberger and theorbo continuo. City Hall, Dublin. Feb. 9, 2013. “Renaissance Choral Chromatics”, with Cois Cladaigh, Galway, Ireland. Renaissance and Baroque choral and instrumental music. Claire Duff, baroque violin, Nina Treadwell, theorbo, lute, baroque guitar, Malcolm Proud, organ. Includes solos on renaissance lute & baroque guitar. Oct. 6, 2012. Engage Arts Festival, Bandon, West Cork, Ireland. “Beyond Baroque”. Nina Treadwell, renaissance lute, baroque guitar, & theorbo; solos and duets with Ilse de Ziah, cello. Sept. 29, 2012. Opera Theatre Company (Dublin, Ireland; musicians sourced from the Irish Baroque Orchestra).Twelve performances of Monteverdi’s Orfeo Nina Treadwell, Principal theorbo and baroque guitar. Venues include: Theatre Royal, Waterford; Town Hall Theatre, Galway; G.B. Shaw Theatre, Carlow; Beckett Theatre, Trinity College, Dublin; Wexford Opera House. June 8-9, 12, 14, 16, 19, 21, 23-24, 26, 28, & 30, 2012. Cork International Choral Festival. Curtis Auditorium, CIT Cork School of Music, Ireland. Madrigal ’75 dir. James Taylor with Nina Treadwell, theorbo. May 5, 2012. Claudio Monteverdi's Vespers, 1610 (A Celebration of the 400th Anniversary of its Publication). Bach Collegium San Diego; Ruben Valenzuela, music director. With Nina Treadwell, theorbo. St. James by-the-Sea, La Jolla, May 23, 2010 and St. John's Episcopal Cathedral, Los Angeles, May 24, 2010. "Vocalizing the Baroque." Directed by Nina Treadwell, lute, chitarrone, & baroque guitar. With Christen Herman, mezzo-soprano & David Morris, lirone & viols. Performed in conjunction with the conference: Unfolding the Baroque. Cowell College, UCSC. April 17, 2009. Santa Cruz Baroque Festival. "Musical Ecology." (Renaissance and Baroque Nature Music). Lux Musica with Samela Beasom, soprano, and Nina Treadwell, lute & theorbo. Music Center Recital Hall, UCSC. Feb. 7, 2009. "Notable Ladies: Baroque Music for Female Vocalists." Directed by Nina Treadwell, theorbo & baroque guitar. Featuring Voxfire with members of UCSC Early Music Consort. Sponsored by Cowell College and the UCSC Music Dept. Music Center Recital Hall. Feb. 8, 2009. “The Sylvan and Oceanic Delights of Posilipo (Naples, 1620).” Staged ballet. Nina Treadwell, Assistant music director, theorbo & baroque guitar. With Mark Franko, choreography; Gilbert Martinez, music director & keyboards, in conjunction with the Galileo Project and MusicSources. Haver Hall, Berkeley. May 4, 2007. Medieval through Baroque music, Performance Practice, Early Music Ensemble, Gender Studies, Queer Theory.